The music would have been an ideal choice for a 60s twist dance,the 'zombie bikers' music video would have made a great Heavy Metal track. However weird a combination "Everybody Talks" was, it sure had all the ingredients to be a successful song. And it was indeed a megahit for the Neon Trees, their best selling track to-date...selling more than 2 million copies in the U.S,reaching the 6th spot in the Billboard Hot 100 charts. With more than 28 million views and 211,000 likes on YouTube, "Everybody Talks" music video was one of the most popular videos of 2012.Many YouTubers have commented how a specific line of the song "It started with a whisper" happens to have the loudest music in the entire song. Similar to Michael Jackson's "Thriller" music video, where the zombies in the movie become a reality, "Everybody Talks" has zombie bikers in the movie and a zombie/vampire waitress inside the movie theatre, who isolates men watching movies, eventually killing them. One has to admit that the zombies in MJ's "Thriller" music video are much more scarier than the zombie bikers (from hell) in "Everybody Talks", where the zombie waitress seem to be using a so called 'scary' Snapchat Filter. Set in a 1950s Drive-in theatre, Neon Trees band members Tyler Glenn, Chris Allen & Branden Campbell ...all loaded up in a single car, drive in to watch the movie Zombie Bikers From Hell. 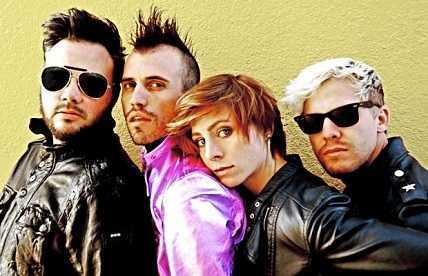 In the movie, the band (Tyler Glenn, Chris Allen, Branden Campbell and female drummer Elaine Bradley) play the song "Everybody Talks" inside a farm house, when the zombie bikers attack them.While in real life the waitress (Chris Allen's real life girl friend) start's targetting male movie watchers seducing, isolating and killing them. She entices many men including Chris Allen & Branden Campbell, scaring them to death with a weird,funny (hardly scary) Snapchat scare filter, while Tyler Glenn stays unharmed. Released on 20th of December,2011 from their second album Picture Show..Tyler Glenn (who looks awfully similar to Brendon Urie﻿) the lead singer, said in an interview that since the album title is very picturesque or highly colorful, hence the band decided to create the music video for "Everybody Talks" equally flavourful. The song gained a thumbs up from the critics for it's a funny opening, when Tyler Glenn coughs to clear his voice before singing...adding more color to an already flavourful song.